The smell of the apples cooking in the brown sugar and cinnamon is so fall! You will have a hard time waiting! 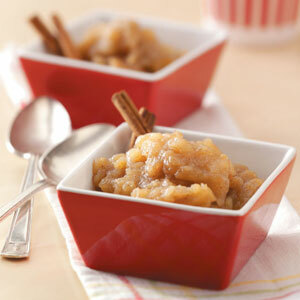 In a Dutch oven, combine apples, brown sugar and cinnamon. Cover and cook over medium-low heat 30-40 minutes or until apples are tender, stirring occasionally. Remove from heat; stir in vanilla. Mash apples slightly if desired. Serve warm or cold. Yield: about 3-1/2 cups.